A wave of sun particles unleashed during a strong solar flare this week is arriving at Earth today (June 24) and could touch off a dazzling northern lights display, NASA officials say. 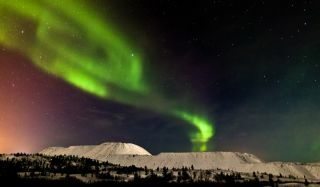 The solar storm occurred Tuesday, June 21, during Earth's solstice, which marked the first day of summer in the Northern Hemisphere and the start of winter in the Southern Hemisphere. The storm triggered a powerful explosion on the sun, called a coronal mass ejection, which sent a vast wave of solar particles directly at Earth at a speed of about 1.4 million mph (2.3 million kph). Those particles are now buffeting Earth's magnetic field in interactions that could amplify the planet's polar auroras, also known as the northern and southern lights. Tuesday's solar flare registered as a class C7.7 flare (C-class flares are the weakest types of flares), but lasted for several hours. There are three classes of solar flares. M-class solar flares are medium-strength flares, while the most intense solar storms register as X-class flares. There is a 30 percent to 35 percent chance of a minor geomagnetic storm in Earth's atmosphere today from this week's storm, NASA officials said. A broadly widening cloud of particles, observed by SOHO's C3 coronagraph, rushed away from the Sun as a coronal mass ejection (CME) erupted over about 12 hours (June 14, 2011). Data from the Solar Dynamics Observatory shows an eruptive prominence breaking away from the Sun about where the event originated. While the originating event did not appear to be substantial, the particle cloud was pretty impressive. The bright circle with an extending horizontal line (above and left of the blue occulting disk) is a distortion caused by the brightness of planet Mercury. This week's solar flare was detected by the space-based Solar and Heliospheric Observatory (SOHO) operated by NASA and the European Space Agency. It came just weeks after another strong solar flare on June 7, which unleashed a massive coronal mass ejection that stunned astronomers with its intensity. The June 7 event kicked up a wave of plasma that rained back down on the sun over an area 75 times the width of Earth. The leading edge of the particles that erupted from the sun were traveling at about 3.5 million mph (5.7 million kph), SOHO officials have said. Another coronal mass ejection on June 14 unleashed an eerie wave of material that formed a partial halo as it expanded into space. The most severe solar storms, when aimed at Earth, can pose a danger to astronauts in space, satellites and even ground-based communications and power systems. This week's solar flare, however, is not powerful enough to pose a serious risk, NASA officials said. The sun is currently in an active period of its 11-year solar cycle. NASA and other space and weather agencies are keeping a close watch on the sun using space-based observatories, satellites and ground-based monitoring systems.